Have the home improvements you’ve made to your home actually increased its value? Here are five creative, thrifty and helpful tips from Summer Baltzer, interior designer and former host of HGTV’s Design on a Dime, to send you well on your way to a kitchen design that not only looks great in the long term, but also reflects you. Improvements don’t increase the value of your home dollar for dollar but they do help. A major midrange kitchen remodel can return about 50.9 percent of their original cost back to New Haven homeowners in resale value according to Remodeling Magazine’s annual Cost vs. Value Report. Design your kitchen around colors and objects that make you feel great. This is the room you probably spend most of your time in whether you’re cooking, entertaining or just doing homework with the kids. Loving the look is important. Make your design meaningful and something you’ll want to see every day. Look for inspiration from a pottery collection, a piece of artwork, or even the food you love. A great way to save money is to repurpose found items for your accents where you can. Frame pictures from favorite recipes, use inexpensive flower pots or mason jars to store utensils and cutlery, repurpose an old console table as a center island. You might even want to spray-paint the old dining table and give it a new life. Look for salvaged floors, pallets or pottery to create new furniture pieces or accents. This approach not only saves you money, but also makes your kitchen enviably unique. Keep your ideas on track by collecting loose drawings; they can become your own personal design board. They don’t have to be professional or even exactly like the finished product – just enough to make your point and start to envision what the finished product will look like. Seeing your ideas come together before taking a sledgehammer to your old tile not only gets you excited about your project, but can also save you from making design decisions that don’t fit your vision. 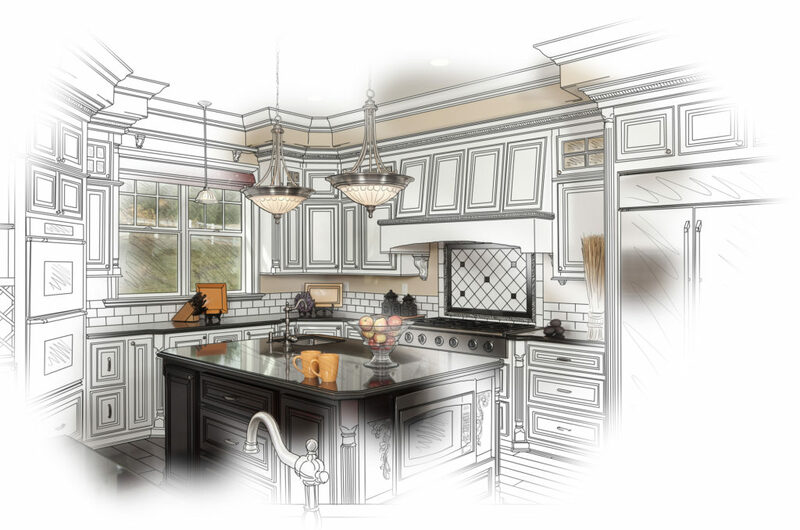 If you’re hiring a professional, plans for the kitchen should be included in the cost. Make sure that they fit your vision and that you’re getting everything you need from your new space before demo and installation begin. When focusing on your large installed items, don’t just concentrate on what’s popular now. Instead, take a look at the items that have been relevant for more than a decade. If you’re designing a kitchen for a home you plan on living in for the next 20 years, by all means, go crazy and embrace colors and patterns that make you happy. But if you don’t plan on staying there forever, give yourself room to grow. Look to classic color combinations like white, black or gray cabinets; stone countertops with white or walnut cabinets; or butcher block with just about any cabinet color you can imagine. Wilsonart’s Calcutta Marble and new Old Mill Oak and Truss Maple are affordable laminate options that look real but are made from recycled wood fibers. They have finishes that withstand daily wear and tear, and are a fraction of the cost of traditional stone countertops. Look to lasting styles and materials, rather than what’s simply trendy at the moment, to create a timelessly beautiful kitchen. Learn more at www.wilsonart.com. Keep the lines of your installed, more permanent items clean and simple. To add style and versatility, get creative with your accents. For instance, try going Shaker with your cabinets. Traditional cup pull handles will move them in a more classic and traditional direction and linear pull handles will take you down a modern road. By keeping your appliances and more permanent items simple, and using your accents to create a sense of style, you’ll open up tons of design doors for yourself, creating a kitchen that transitions easily, keeps up with your style and has staying power.